A massive Singapore chipmaker tried a $140-billion hostile takeover of its American semiconductor rival, Qualcomm, and failed when Trump killed the deal over national security concerns that are all about China. Late Monday night, the Committee on Foreign Investment in the United States (CFIUS), chaired by Treasury Secretary Steve Mnuchin, blocked Singapore-based Broadcom’s (NASDAQ:AVGO) hostile bid for Qualcomm, citing an executive order from the president. The $140-billion deal in cash and shares “threatens to impair the national security of the United States,” CFIUS said. The deal-killing executive order came as a bit of a shock to Broadcom, which had been lobbying heavily with Trump, and even promised to pump $1.5 billion in investment into U.S. R&D. 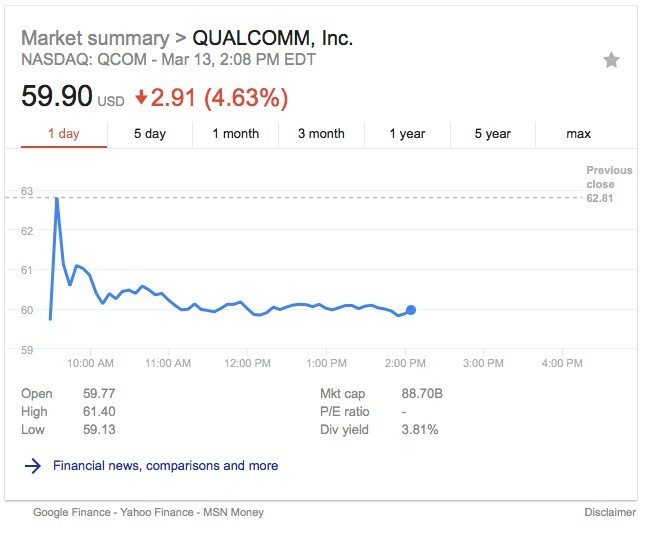 It also came as a shock to Qualcomm stock, which has lost over 4.6 percent since after-hours trading Monday on the news. 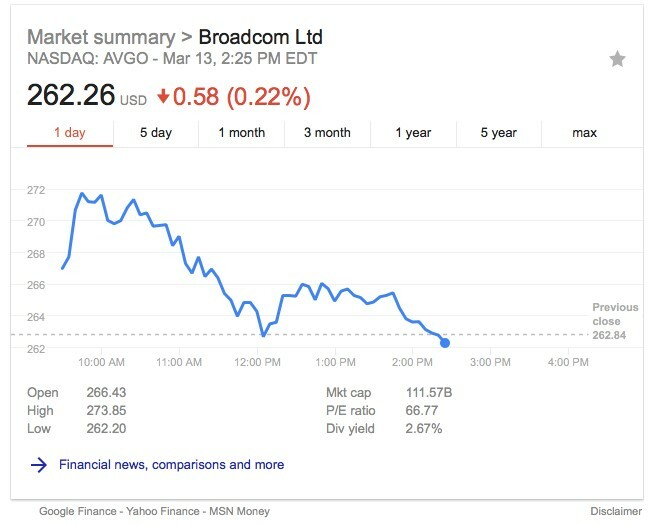 Broadcom was down 0.22 percent today. Broadcom was founded by UCLA academics in southern California in 1991. It was acquired by Singapore-based Avago Technologies in 2016, and headquartered in Singapore. But Broadcom was willing to bring it back to California. And it thought it had appeased the CFIUS with its $1.5-billion R&D pledge, after it became clear that the authorities were concerned a hostile takeover would quash research and development at Qualcomm in favor of short-term profits. What the U.S. government is saying, then, is that the semiconductor sector is a strategic industry, and Qualcomm is a critical part of America’s leadership position. National security isn’t just about missiles and spies. It’s about maintaining the nation’s supremacy in key industries that are strategic for a number of reasons. In this case, it’s about ensuring that the U.S. keeps the lead in terms of semiconductors and mobile technology. The overriding sentiment from the White House and national security officials was that letting a Singapore-based company take over Qualcomm would be tantamount to handing the lead over to China. It wouldn’t have been a small development: The takeover would have turned the company into the third-biggest in the industry, and it would have had a leading market share. 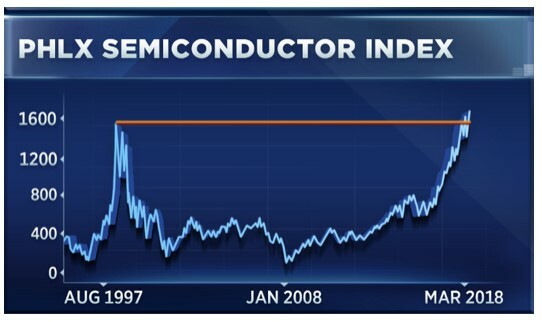 And right now, nothing can halt the brute march forward of the U.S. semiconductor market. It’s hotter than hot, with share prices higher than they’ve been since 2000 and Y2K was a thing. 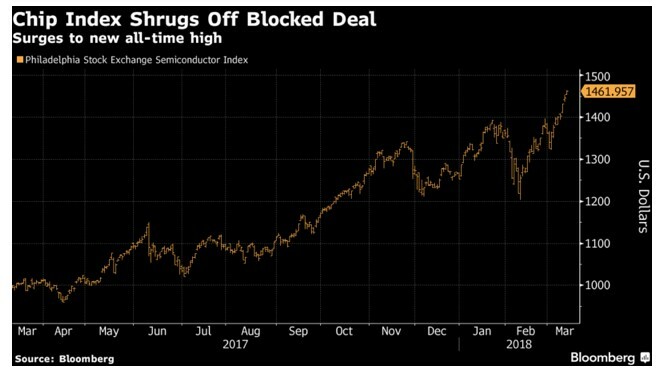 The PHLX Semiconductor SOX ETF, with 30 chip stocks, speaks volumes about this sector, which defied even the February market sell-off. Micron Technologies (NYSE:MU) has soared, gaining over 41 percent just in the past three months, with Mizuho raising its price target from $55 to $66 on strong memory demand. Nvidia (NYSE:NVDA), an unstoppable chip beast, has gained nearly 30 percent over the same time period. Intel (NYSE:INTC) has seen a ~20-percent rise over the past three months. The chip industry didn’t even blink at the deal-kill. Qualcomm, which many say could be negatively impacted by the failed hostile takeover by Broadcom, remains a potential buyout target—even if the buyer might have to be closer to home. In the meantime, Broadcom isn’t likely to stray from the acquisition path, even if it can’t take over Qualcomm, with sources on Bloomberg identifying possible targets as Xilinx Inc., Mellanox Technologies Ltd., or Acacia Communications Inc. All of these are much smaller and far less attractive targets than Qualcomm, which will remain—for now—a critical piece of the American chip leadership picture. What Does A Strong Euro Mean For Gold Prices?